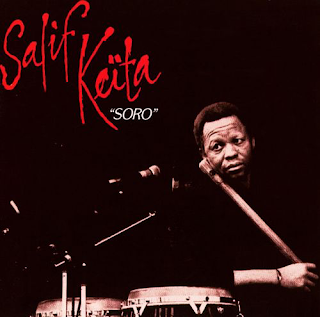 This is very much a "crossover" world music album from Mali's Salif Keita, who had cut his teeth with the rhythmic Super Rail Band De Bamako before re-locating, as many West African musicians did, to Paris, in the 1980s. The album blends traditional Malian sounds of female backing vocals, lilting, slightly skanking guitars and rhythmic percussion with the curse of eighties music - synthesisers and programmed drums. The latter is one of my least favourite styles of music, but it works here because Keita's nasal, distinctive voice soars atmospherically over it, and seems to even enhance it. It provided the perfect album for trendy wine bars in the eighties/nineties who wanted to show how turned on they were to "world music". It certainly got a lot of people interested in this sort of music and sales of the album were huge. Either way, it is an evocative, addictive album although I have to say the eighties instrumentation does date it somewhat. I prefer my Malian music to be more authentically ethnic, leaving out the synthesised European backing. That said, There is still a lot of appeal to this album. The sound on it is superb too.